Value stream mapping is a tremendously valuable tool for improving a process, but it requires patience and careful attention to details. In an earlier post, I shared some value stream map guidelines to help ensure that the energy you invest pays off. Here are some additional items to consider. Identify critical paths and bottlenecks. Your map may reveal a number of potential areas for improvement. Which ones will make the biggest difference in meeting customer requirements? Create a future state map from the current state map. Your current-state map suggests where to focus your efforts, so you can draft a map that shows how value will flow through an improved process. Limit the improvement plan to achieve the future state to a one-page document, if possible. List the actions that need to happen to improve the process. Use simple, clearly-defined steps. To implement the improvement plan quickly, focus on individual areas. Take a step-by-step approach to putting your plan in action, then update your future state map as you implement each step. It’s not an easy undertaking, but making a good value stream map is a great way to help everyone involved understand and see where improvements can be made. 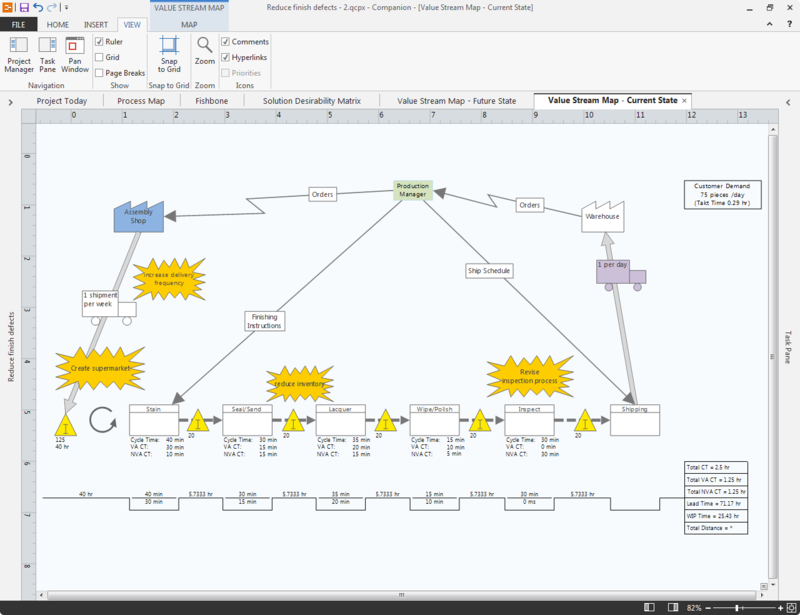 Our all-in-one process improvement software Companion includes a powerful built-in value stream mapping tool that makes this technique lot easier and gives you valuable information to help you implement and assess you project’s progress. For instance, as you add data to the shapes on a value stream map, Quality Companion automatically calculates metrics about your process and displays them below the Inventory and Process shapes in a series of peaks (inventory time) and troughs (cycle time).